My little one was born at 6lbs 3oz, so cloth diapers did not fit him for a while (my stash are all one size). Because of this, we started out using disposable diapers and wipes. He got a horrible chemical burn at two weeks old, mainly from the wipes! He would cry every time it was time to change him and even when he used the bathroom because it was so bad. Till this day (he is almost 2 years old) he freaks out when he sees a disposable wipe coming his way. Although I could not immediately switch to cloth diapers, I at least started using my cloth wipes. I played with different cloth wipes and cloth wipes solutions because his skin is so sensitive and I did not want to make his rash worse. My goal is to share what works for us so that you don’t have to waste time or energy finding the perfect solution. The best cloth wipes for sensitive skin are by far these organic osocozy wipes. They do not have any allergenic or harsh chemicals and are made of unbleached, organic cotton. They are also really soft and gentle on baby skin and just glide when wiping. Furthermore, they are super absorbent and do can hold a lot for their small, convenient size. Another benefit is that in one month of using these, you will have already saved money compared to what you would have spent on disposable wipes. Tea tree oil and lavender oil are not good for sensitive bottoms! Seriously, I cannot stress this enough, RUN FROM THEM!! The tea tree oil just burned my sons skin and irritated his rash even more. It was awful! He cried every time I used it, even though it was extremely diluted. I found that less is more when you are dealing with sensitive baby skin. 3 tbsp of Coconut Oil: Helps the wipe glide across baby’s skin and keeps skin soft. Also has a ton of anti fungal properties. An unscented organic castile liquid soap is a must when it comes to a cloth wipe solution for sensitive skin. This is going to be the part of the “recipe” that removes all traces of urine and feces from baby’s bottom, so it’s really important. It’s great because it doesn’t contain any synthetic detergents or preservatives, which makes it wonderful for baby skin. Not to mention it leaves baby’s skin nice, clean, smooth and moisturized. Check out the Organic Castile Soap Amazon reviews from other moms here. 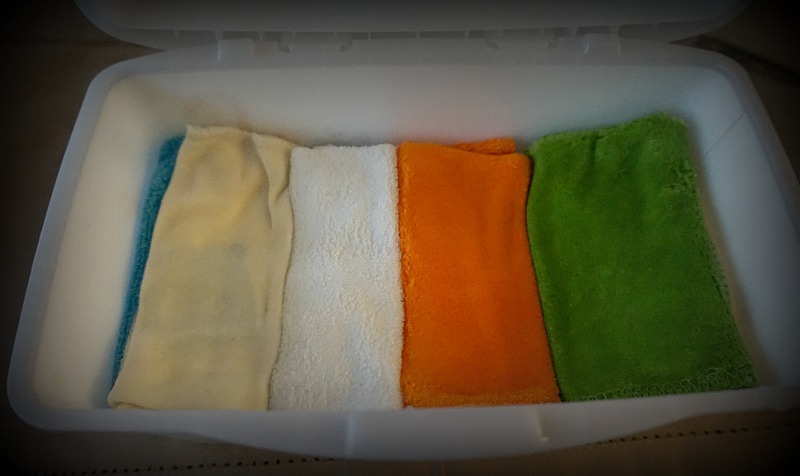 Roll up the wipes and put one layer in the wipe warmer, or container of choice, and pour some of the cloth wipe solution over it. Then add another layer of rolled up cloth wipes and add more solution. Keep going until I’m the container is full. Squish them all together to make sure they are all nice and wet. ===> For the best coconut oil you can find, click here. 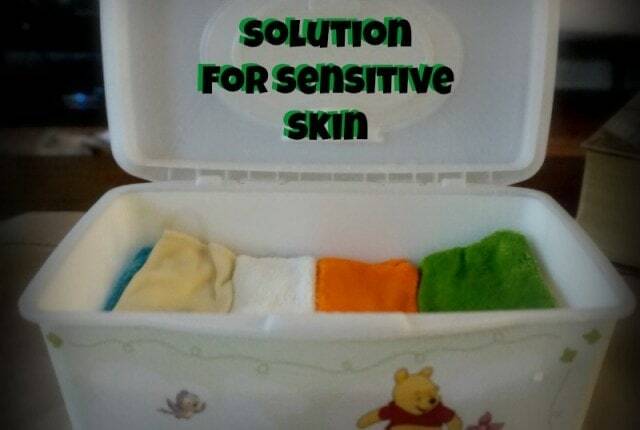 The best way to store your wipes and solution is in a good wipe warmer. I originally just used an empty tub of disposable wipes and the wipe warmer is definitely longer lasting, looks better in the nursery, and keeps the wipes wetter. I also like that it keeps the cloth wipes warm so you never shock your baby with a cold wipe. This is especially awesome for those middle of the night changings when you don’t want your baby screaming! Mine has lasted two years already and I am getting ready to use it for baby #2 as well! My son hasn’t had any diaper rashes since switching over to these wipes and solution!